 The landscape of modern marketing is defined by speed and change. The greatest challenges now facing brands look very different from not long ago. The Bloomberg Solutions Lab is designed to chart unexpected ideas in fast-moving times, bringing a unique diversity of expertise to our work with partners. Collaborative four-week sprints deliver actionable, high-performance solutions to the challenges facing brands in the marketplace of modern business. Customer experience. We use data and research to develop a nuanced, human view of needs and behavior. This allows us to identify points of connection between brands and consumers at moments of opportunity or need. Innovation. We help clients define their place in the future by mining the unfamiliar. We innovate with clients towards growth and transformation with an approach that is both analytical and creative. Custom solutions. We can put our methods of research and collaboration to work on any marketing challenge. We are here to work with you to create breakthrough answers to hard questions. Our approach combines objective analysis, business intelligence, and expert perspective with design-oriented agility. We partner with brands from strategy to execution, building powerful new marketing ecosystems.